The arts disciplines offered are visual arts, dance, movement arts, music and recording arts, theatre, media arts and creative writing. Sketch has community partners who they refer youth to for basic needs and community supports. Community arts becomes a way for youth to be engaged with the broader community. Participants can initiate projects outside of Sketch, and Sketch will help provide training and facilitation of the connection. Sketch is a community arts development initiative that was founded in 1996 by Phyllis Novak. Its mandate is to engage youth who are street involved, homeless or otherwise marginalized in a progressive arts learning framework. 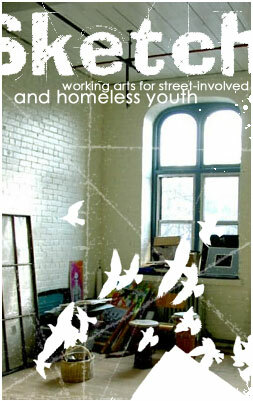 The main premise of Sketch is that the arts are a response to homelessness and poverty. The arts provide an entry point into civic participation, cultural identity and social change. Their model includes open studio skill building, community connections and youth leadership programs. Sketch is really good at “celebratory and wacky engagement of youth as organizers! [ It is known for ] trying things, making mistakes and learning. [ It is also known for] it’s strong intentions to build healthy relationships [as well as] respecting the unique perspectives of marginalized community, street involved and homeless youth. “ Sketch’s goals this year are to proliferate its model and find ways to share their experience in learning and working with street involved youth to the broader community locally, provincially, nationally. Sketch’s challenges this year are sustainable fundraising and the need to relocate their studio site. Their ongoing challenge is to help people understand that community arts practice is a viable way to renew people, neighborhood, education, the economy and the whole community. This year, Sketch could use some support with policy writing for their programs. They need a writer who can present the policies in a fluid, active and living way. Community Served (continued): Sketch works with youth ages 16-30. They come from all across Canada and represent a vast array of youth who live homeless. Many are transient, living rough or moving between shelters and some are staying in their first apartments. Last updated on 2016-01-18 14:57:27. Submitted by: Phyllis Novak, Artistic Director (ArtBridges interview, February 4th, 2010).